Lacey Loves Food | Not everything in the south is fried! Amuse Bouche. 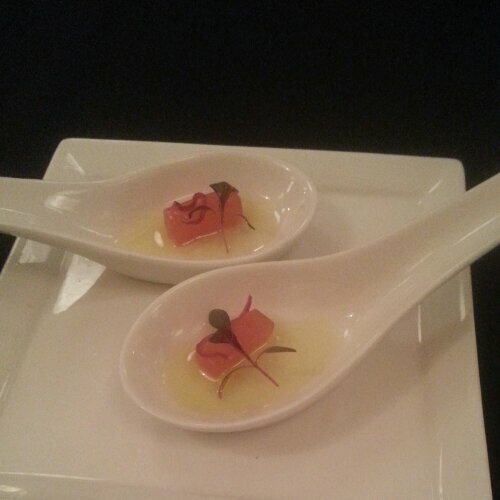 Tomato Gelee with Micro Basil in Extra Virgin Olive Oil. Posted in Uncategorized and tagged Nashville. Bookmark the permalink. We look Zeppelin home with us on July 4, 2008. 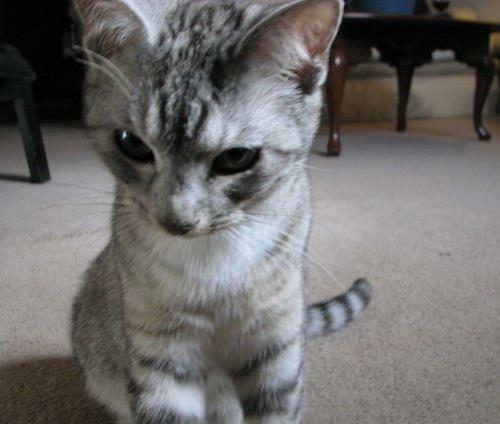 He was not quite six weeks old, and certainly too young to be adopted, but his mom had abandoned him and his siblings. Right from the start Zep was very different from our other cat, he was more loving, sweeter, friendlier…but he was also a jerk who wouldn’t cover up his poop in the litter box, who insisted on cleaning himself in my lap, and who wanted to sit as close to my face as humanly possible. 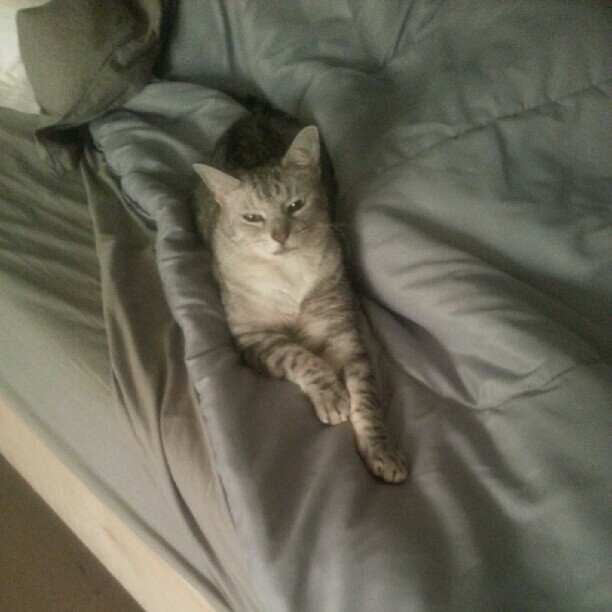 I mean, the cat liked to sleep on my pillow. Zeppelin was my little buddy. Wes and I have three companion animals, and I love them all, but Zeppelin was MINE. He and Wes had issues, Zep liked to pee on Wes things-frequently. He never did this to me. Our friend Jeff likes to tell the story of how at our old place, Zep was dying to go outside and Wes didn’t want to let him out; so Zeppelin, while looking straight at Wes, walked over to a $300 pair of hiking boots and peed in them. I’m not sure I’ve ever seen Wes so mad. “YOUR CAT RUINED MY SHOES!” Zep liked to pick fights with our other cat, and cuddle with our rescued dog. He liked sitting on heating vents and sleeping on my pillow next to my head. He liked to cuddle. About six weeks ago on a Saturday I woke up and Zep wasn’t in the house; which didn’t concern me at first because our cats have a habit of sneaking out the dog’s door. By that afternoon though, I was worried. I started to think he’d run off. A week later, i was convinced he was in someone’s house. He’s easily the friendliest cat I’ve ever been around. I was cleaning trash out of the back yard yesterday (our rescue likes to steal trash and put it outside). I looked up and saw my poor baby dead. He’d been attacked (very recently by the looks of it) by an animal that was clearly much larger than him. I miss him so much. It’s been a really rough couple of days. 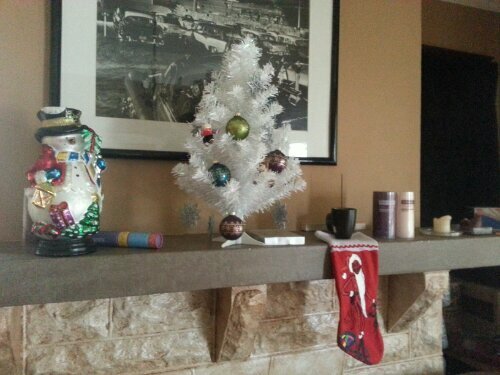 Who uploads Christmas pictures in March? 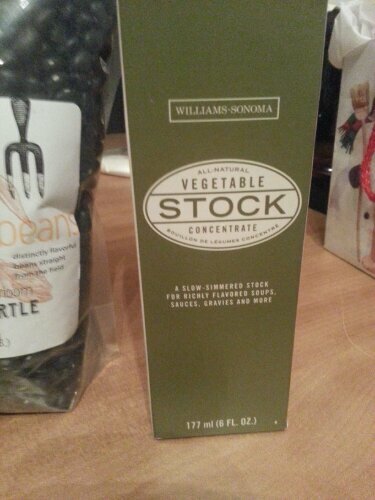 So i got a LOT of food related items for Christmas. This is likely because I’m a food obsessed girl who’s not really into clothes, makeup or seriously girly stuff. I use to be. I’m unhappy with myself physically though so i’ve gotten away from loving those things. sigh. work to be had. 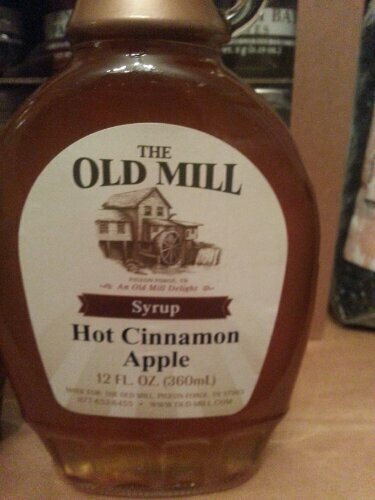 Hot Apple Cinnamon Syrup: this stuff is interesting. Not everyday syrup. THis is what happens with FOUR KIDS open presents at once. Yes, only four. 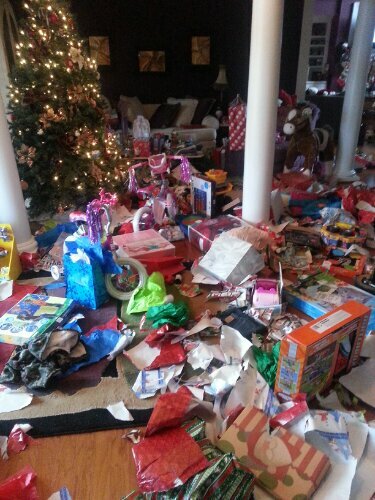 The rest of us cleaned this up then opened our gifts. 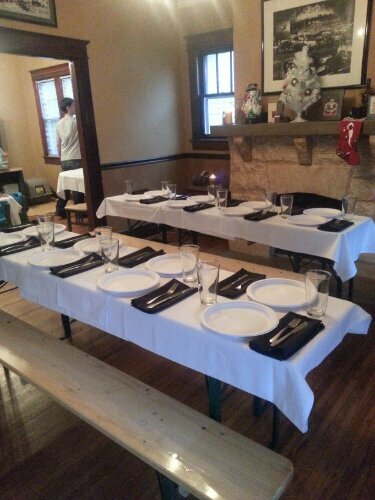 Wes and I hosted Christmas dinner at our house. We had 18 people. INSANE. 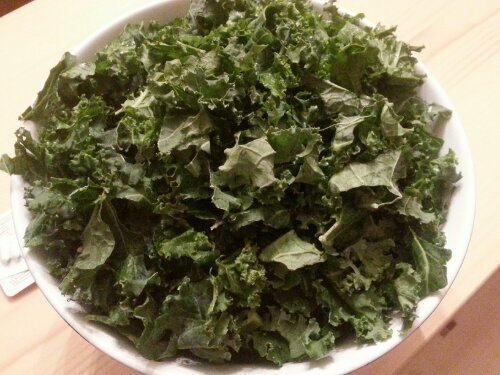 I made this INSANE raw kale salad for my family. It was all eaten up. EIGHT bunches of kale with a lemon-tahini dressing. mmmmmm. 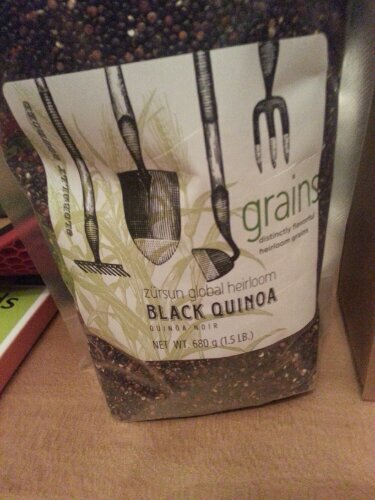 Heirloom quinoa. 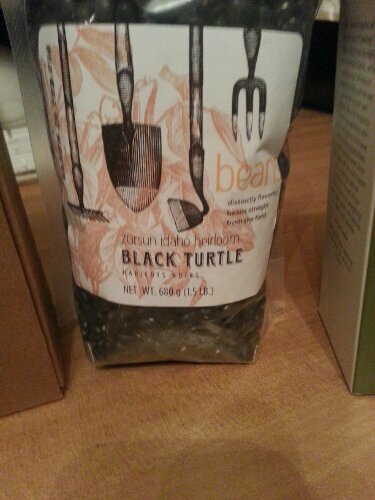 Black quinoa tastes no different than the regular stuff if anyone ever wondered if it was worth the extra money. It’s not! 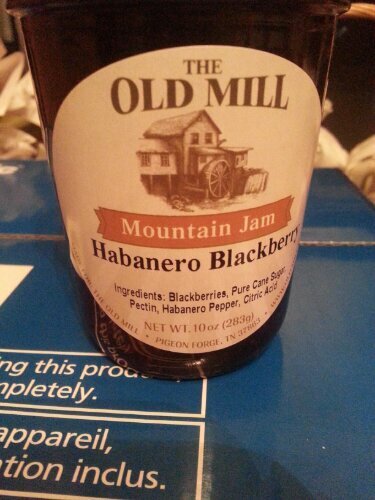 I had no idea this existed but it’s awesome and has become a regular staple. 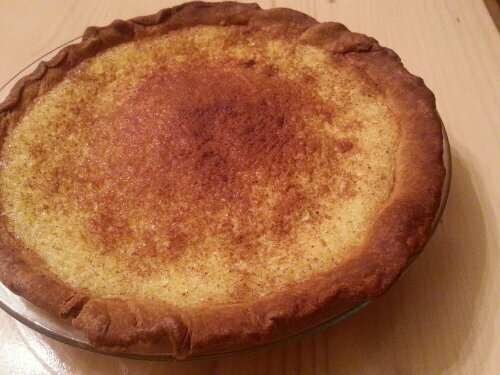 vegan buttermilk pie. basically this is like a lemon custard pie. 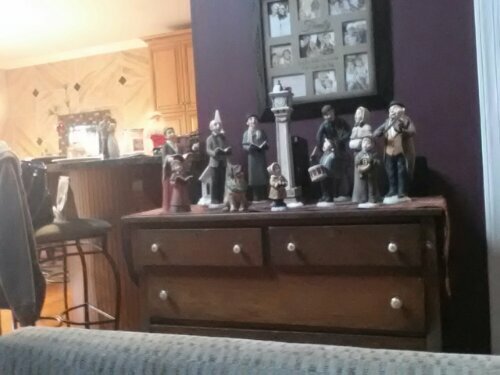 sparse decorations at my house; my husband is not a fan of holiday decor. 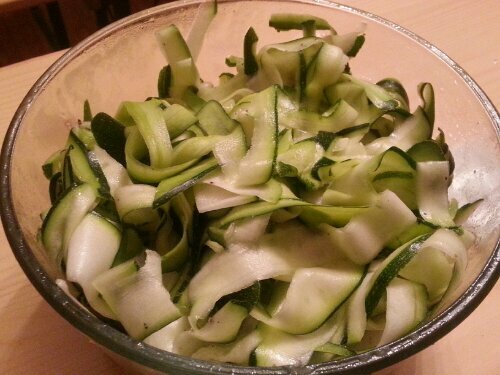 The Raw zucchini salad that was also part of dinner. 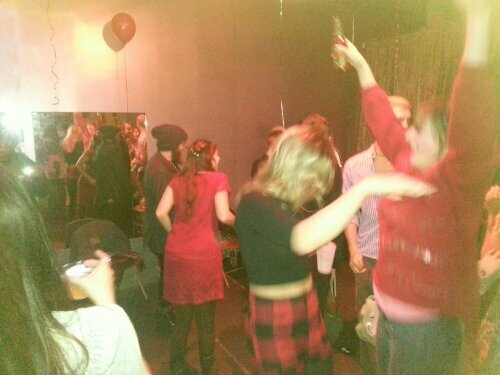 dance party for the holidays. 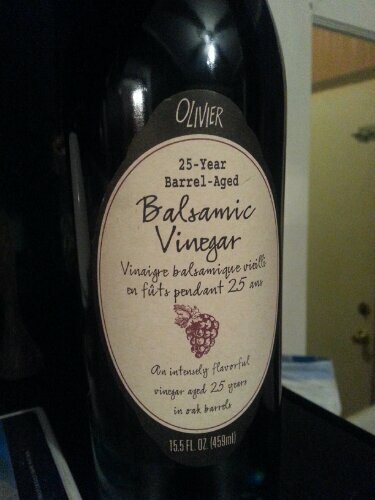 i made chocolate cookies with this. AMAZEBALLS. haven’t tapped into this yet-saving this for something special. 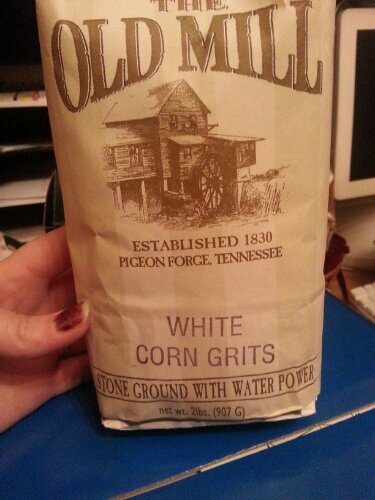 the best grits in the world; the only ones i like. you should buy them online. you won’t regret it. 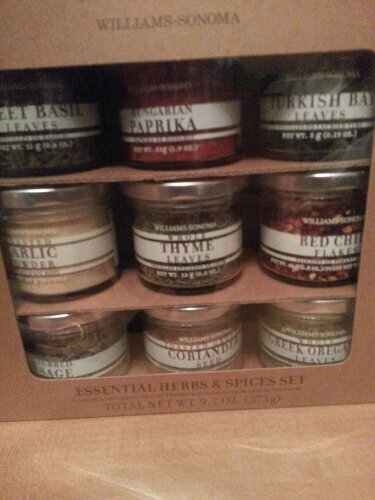 spices from the in-laws. i had most of these but these are more potent than most; LOVE. Seriously you guys, go buy the roasted garlic powder from Williams Sonoma. It’s INCREDIBLE. As some of you may know, I was presented an opportunity to assist Lindsay Nixon of Happy Herbivore back in September, just as she was heading to do her book tour of Finland and Ireland for Everyday Happy Herbivore. I’ve become close to Lindsay online and have immensely enjoyed assisting her. Now, Lindsay has a full time assistant, I handle helping out with Instagram and Twitter now, but It’s a real pleasure being part of something I really believe it. it’s with great excitement that I submitted to participate in 31 days of giveaways. 1. What’s your favorite easy-to-make breakfast? Lately I’ve been making my oatmeal with frozen raspberries and topping it off with vanilla almond yogurt… but I get bored and tired of things easily, so I’m sure this will change by next week. 2. How did you choose Lily and Quaid’s names? Right after we’d been approved to adopt Quaid, Scott (my husband) & I went back and forth on names for days. We were scheduled to pick him up the next day and we still hadn’t decided or settled on something we both liked… Anyway, I was in law school at the time and going over a case for class when I saw the name Quaid — it was someone’s name — and I said “hey what do you think of this name?” It was perfect. Quaid’s middle name is Liam, which Scott picked. I’m not 100% but I think it’s an nod to Liam Neeson. As for LB, since *I* technically named Quaid, Scott thought he should get to name our daughter. He wanted her to have a really girly name and picked Lily. I thought Lily was too simple so I asked about adding “Bean” to it — and he agreed. I got to pick her middle name — Andalusia after my favorite part of Spain. 3. What’s the least plant friendly place you’ve traveled to and how did you handle it? The U.S.! Joking, sort of. I’ve never had trouble finding plant-based fare — anywhere in the world. It may not always be ridiculously easy like finding a burger in a McDonalds, but with a little patience I always find something and more often than not, it’s delicious too! 4. What’s your best rebuttal for when people want to include non plant items in holiday menus because it’s “tradition”? 5. What’s your favorite US city? I don’t really have a single favorite — many cities (and areas) in the U.S. are so different from each other that you can’t compare. How can you compare the mountains to the desert, for example? 6. We know you don’t eat broccoli and you’re not an eggplant fan; are there any other plants that you don’t care much for? I’m also allergic to cauliflower (by proxy – thanks broccoli!) and I’m not much for nuts or seeds. I can’t stand wine — for drinking, unless it’s been turned into sangria. I don’t mind it in cooking. I also don’t do spaghetti. or noodles really. oops? 7. Do you ever have to cook separately for you and Scott? I know he is plant based, but sometimes that doesn’t mean he eats the way you prefer eating? 8. How do you handle family potlucks when non-plant based people are your hosts, do you cook your own full meal and bring it along? It helps that most of my friends are vegan or vegetarian, and my sister and parents are plant-based. 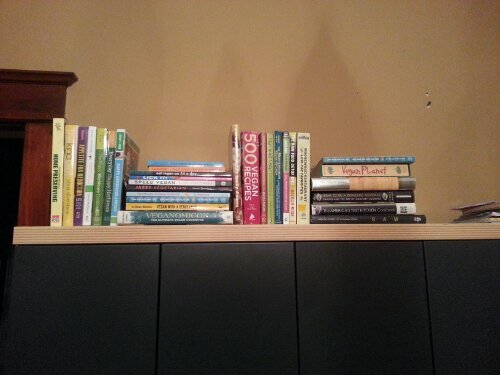 Scott’s family is also mostly plant-based. My other relatives (extended family) generally try to accomodate me, which I appreciate. For example, when my cousin was having a barbecue, he went to the store to find vegan burgers and even had the forethought to place foil down on the grill to avoid cross-contamination. I really felt loved and respected! I have about a dozen posts on happyherbivore.com‘s blog about potlucks and what to feed omni’s if you need recipe ideas. 9. What recipe creation are you most proud of? In Abroad? I guess the German Lentil Soup. It took 4 tries to get that one just right. 10. What’s your favorite main protein source: tempeh, seitan, tofu or beans? Lindsay’s latest work is mindblowing. I’m so in love with everything about Happy Herbivore Abroad. I received an advance copy a couple of months ago and I’m obsessed. And i want you to be obsessed too! The new year is upon us and what better time to pledge to live a healthy, happy 2013? I personally will be living on meal plans http://www.getmealplans.com for the next several months because I need to, but I could honestly cook HHA and still get the same effect: glowing skin, a trimmer waist, and a lower grocery bill. If you want to win HHA, comment here and tell me why you want it. For extra entries, tweet about this blog and mention @kuntrageous and @happyherbivore on twitter, then comment that you’ve done so. The same goes for Facebook, just let me know you told your friends about this contest in a comment. For a 4th entry, tell me your favorite Happy Herbivore Recipe, and for a 5th entry, follow @happyherbivore on Instagram and let me know you did so. The contest is open until January 7th. This contest is open to US residents only!. I got a ten pound spaghetti squash for $2 at the farmer’s market. It was so big that I wasn’t able to slice the top off without assistance from my husband. I *never* have to ask for help cutting something. Anyways, I cut that bad boy in half, removed the seeds out with an ice cream scoop, chopped up 8 cloves of garlic, threw them in the squash halves, and baked them cut side up at 400 for about an hour. 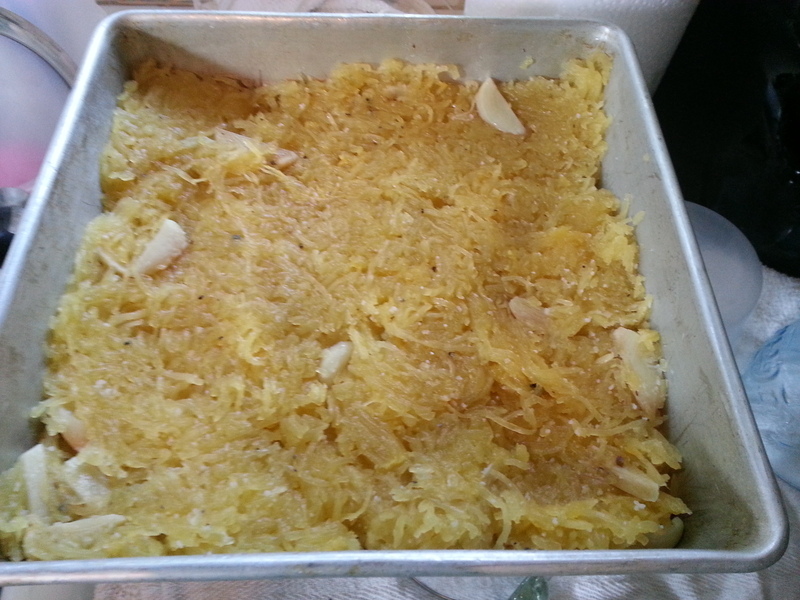 I scraped the insides and ended up with around 6 cups of spaghetti squash. I thought there would be more!! 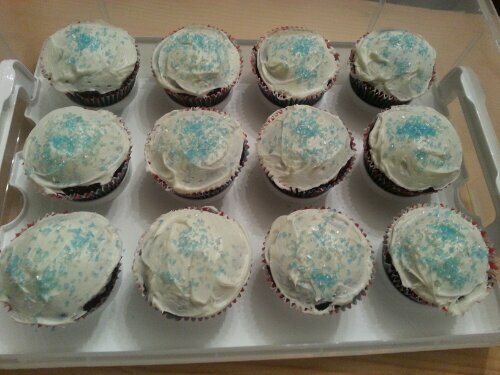 After baking this, I really didn’t know what I wanted to do. I had a lot of ideas, but at the end of the day, I decided to do something new rather than something I knew would work. I’ve been in a food rut, so eating outside of the box is a great way of getting myself to be healthy and stay interested. 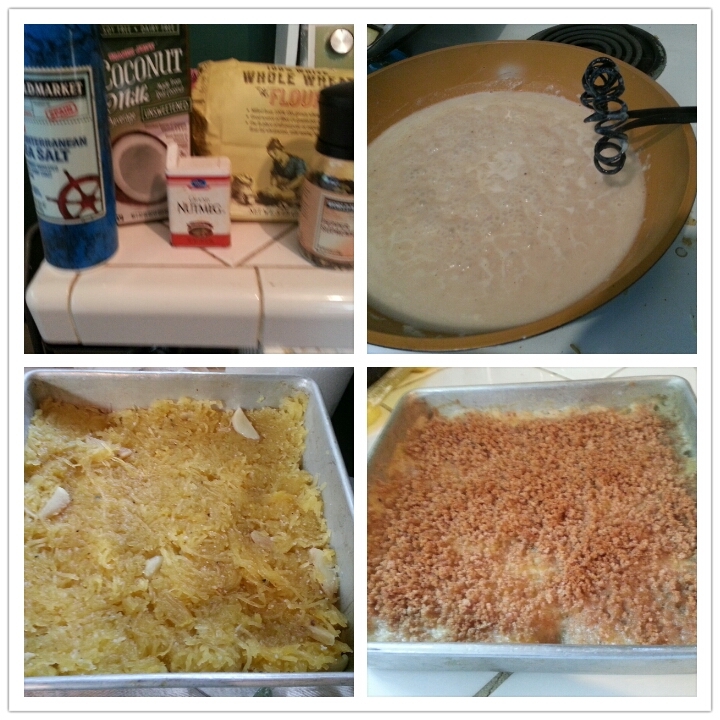 After a few searches, I found a recipe for vegan spaghetti squash gratin made with almond milk and cornstarch. I didn’t have cornstarch, and I’m really not fond of what it does to sauces anyways, so I decided to wing it and make a vegan white bechamel. The catch is that I’m trying to eat clean, so I was reallllllllllllly winging it. 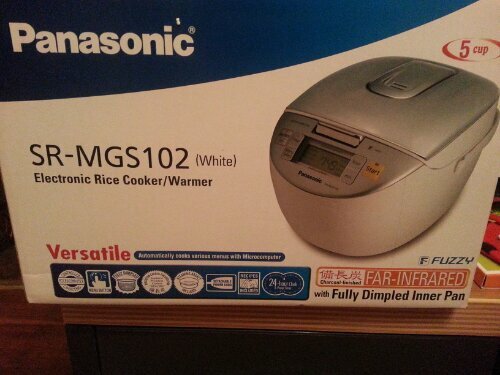 Preheat the oven to 400. You want it nice and hot. 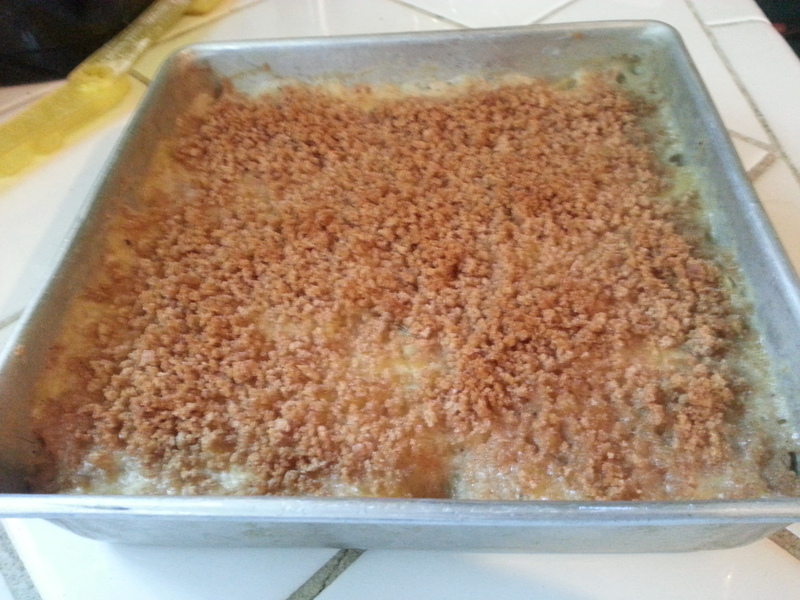 Place the above in a baking dish and set aside. 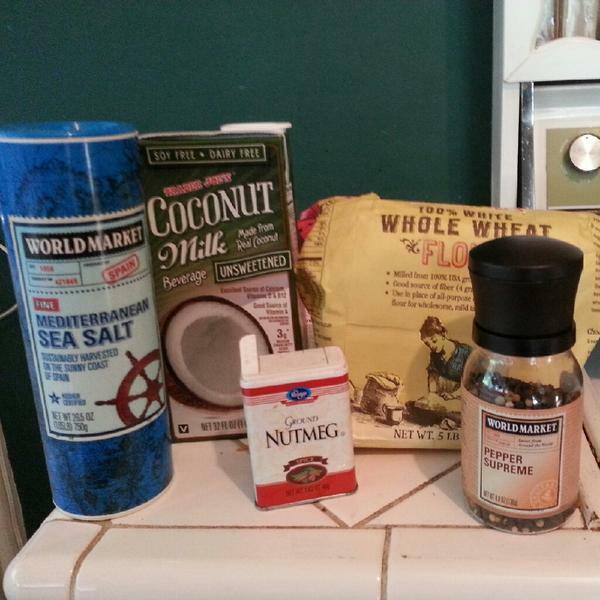 Heat coconut oil over medium in a large skillet until very hot. Sprinkle in flour and stir together for 2.5 minutes. 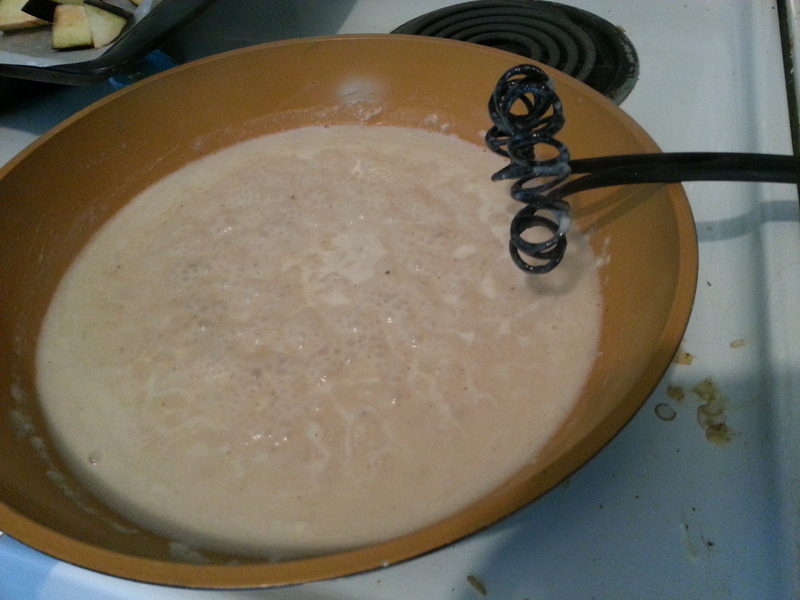 Slowly whisk in coconut milk stirring constantly to combine and keep lumps from forming. Add salt, pepper, nutmeg, and garlic granules. Taste to check salt/nutmeg/pepper/garlic levels and add more to taste. Heat over medium high heat until bubbling. Stir constantly until sauce thickens; for about 9 minutes. 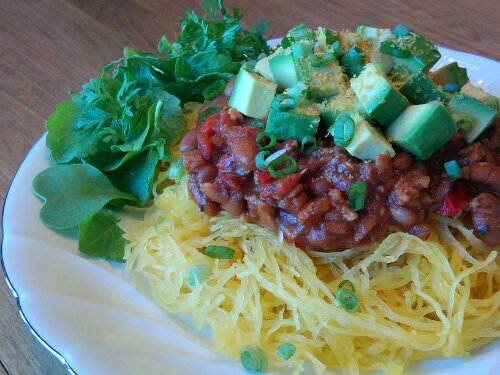 Pour sauce over spaghetti squash and stir well to combine. Combine the above and sprinkle over the top of the spaghetti squash and bechamel sauce mixture. Top with a few turns of fresh ground black pepper. Bake for 35 minutes; until sauce is bubbling. Don’t judge my ugly square metal pan. My husband has managed to break two baking dishes and my small pyrex pan. He’s a disaster with glass! !